I know, it seems so unlikely, but it is me after all and if there are obscure places out there to find handbags, I'm your woman. As I knew the Eden project was all about plants and stuff (can you tell how much I was looking forward to it? 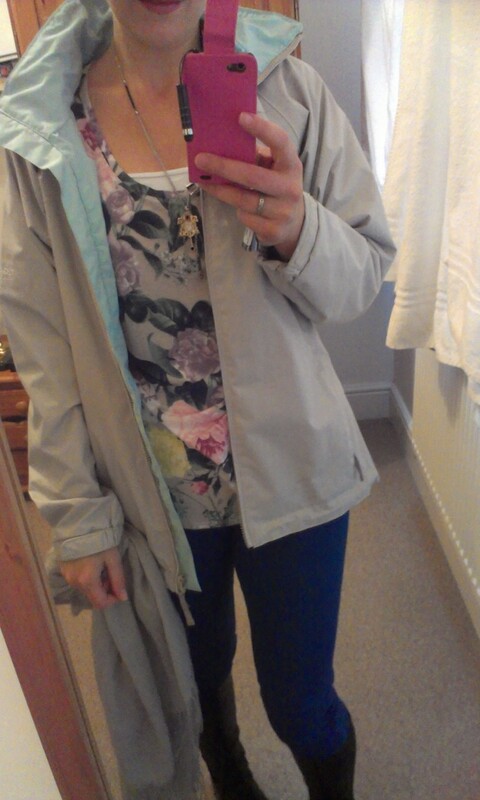 ), I wore my floral H&M top (last seen here). 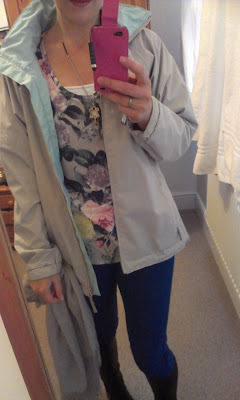 I teamed it with French Connection skinny jeans, white vest from Primark, long boots from Hobbs & a not very trendy but very practical Regatta anorak. Sorry to all you fashionistas out there...I am not proud of my anorak-wearing but I am playing my holiday card here - we all wear stuff on holidays we might prefer not to. After a slow start, I found myself enjoying things once we got into the Rainforest Biome. By the time we'd climbed to the top of this tropical zone, we were absolutely steaming (not in the Northern Ireland alcoholic sense, but in the hot and humid Amazonian Rainforest sense!). The boots were starting to feel like a bit of a liability by this stage and the kids had stripped down to their vests.. But to cheer me up, shortly after this photo, we headed to the Eden Project shop and low and behold, they had the most amazing handbags in stock, made by a company called Bottletop. I fell in love with this metallic (made from ring pulls) handbag - how incredible does it look? I love how it combines eco with style..easier said than done. It achieves this because it doesn't look like ring pulls until you look closer. From a distance, it looks like an amazing chain mail effect in a fantastic neutral colour...endlessly wearable! While you can pick up other handbags on the Eden Project online shop, the Bottletop bags are only available online, directly from Bottletop's website. Check it out to see the great selection of bags, clutches, purses & belts. Amazing photography on the website too - very slick. That's some bag, I'm going to look at the website. And I'm glad u and K resisted the urge to take off your tops! Wow i really ,ove that bag, in fact I found it here in italy too and I was considering to buy it! Super cool!!!! I love finding unique pieces especially eco-friendly ones. I've always wanted one of those seatbelt bags! That bottle cap bag is amazing!! And thank you so much for the comment and for following my blog!! I am following you back with pleasure! !